use the car to visit the town or reach the many local restaurants. Villa Mosca Charming House is embedded in a unique location. Charm, history and culture. 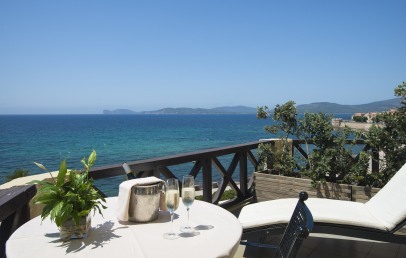 Spectacular views and lush grounds along Dante promenade in Alghero. The Charming House is a few steps from the sea and from the old town, protected by ancient ramparts. The sea view, the breathtaking panorama on Capo Caccia promontory and on the surrounding villas add a relaxing atmosphere to Villa Mosca Charming House. Villa Mosca Charming House is a prestigious residence, characterized by an octagonal shape and large windows. It is an historic property safeguarded by cultural and architectural assets. Art nouveau style, featuring soft lines, floral elements and whiplash motifs match perfectly with services you would expect of a high-quality hotel Design. 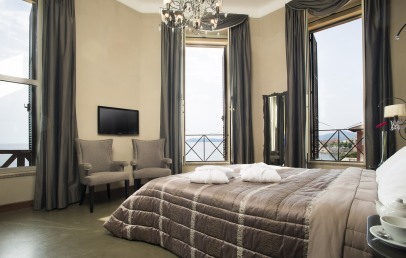 The 9 rooms at the Villa Mosca Charming House are remarkable because of their style and comfort. All rooms dispose of a bathroom with shower, air conditioning, hairdryer, satellite TV 32", mini fridge, Wi-Fi internet connection, safe and courtesy set. Two sunbeds will be reserved for guests in the grounds. 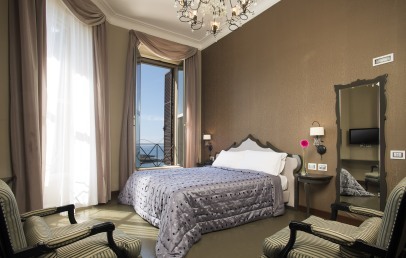 The Superior and Deluxe offer also a sea view. 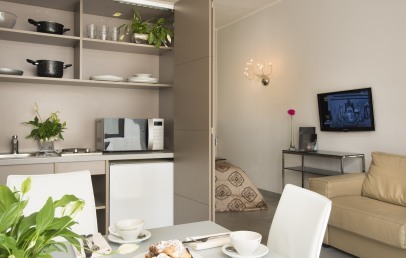 The "Villini" accomodations are instead ideal for those who prefer a personal living room to discuss business and a fully equipped kitchenette at your leisure. If necessary, a sofa bed can accommodate a third person. Surrounded by the greenery and about 20 meters distance from the Villa, these independent buildings dispose of the same comfort of the rooms. The nearest beach from the hotel is at 50-100 m distance and it is a very small one with no possibility to rent any sun umbrella and loungers. Other beaches with beach service are located starting from 3 km distance from the hotel. At guests disposal are the reading room, the lounge bar, jacuzzi and free internet Wi-Fi connection throughout the hotel as well the sunbeds in the garden of Villa Mosca Charming House. On request business meetings and wedding cocktails as well as restaurant-pizzeria can be arranged. 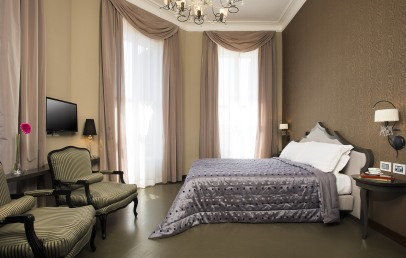 Welcoming double room decorated in Art Nouveau style, located in a mansard 2nd floor. 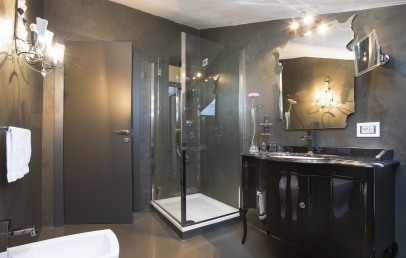 The private bathroom is equipped with shower and courtesy toiletry set. Two chaises longues will be reserved for guests in the grounds. Bright and welcoming double room located in the noble level of the Villa. It is characterized by Liberty furniture, care of details and by charming atmosphere. 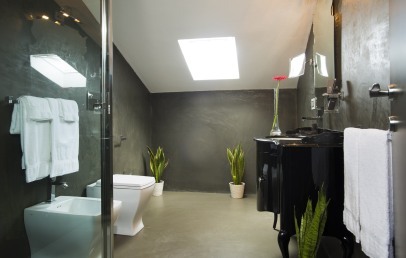 The private bathroom is equipped with shower and complimentary toiletries. 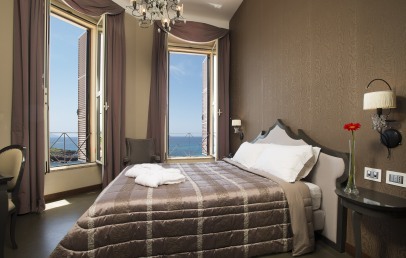 As recall its name, this rooms have a lateral sea view and garden view. Two chaise-lounge will be reserved for guests in the grounds. 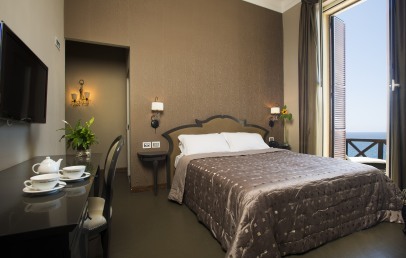 Large double room decorated in Art Nouveau and characterized by soft and essential lines. Elegant and modern at the same time it offers several services. 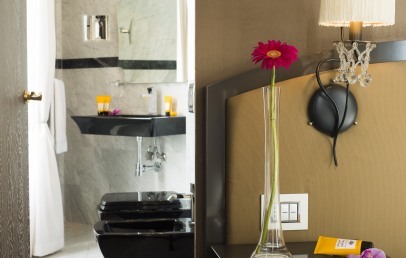 The private bathroom is equipped with shower and courtesy toiletry set. The Deluxe rooms face a wide balcony with wonderful sea view. Two sun beds will be reserved for guests in the grounds. 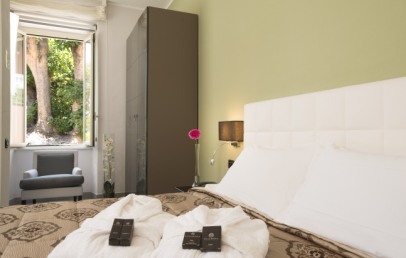 Surrounded by the greenery of the Villa's grounds, it is composed of bedroom, living room with sofa and kitchenette. Elegant and comfortable, it is ideal to discuss business or if you prefer a kitchenette at your leisure. The bathroom has a shower, hairdryer, make-up mirror and courtesy toiletry set. They have an independent entrance from the garden and a equipped patio. Bright and welcoming double room located at the 2nd floor of the Villa. It is decorated in Art Nouveau and characterized by soft lines and floral elements. 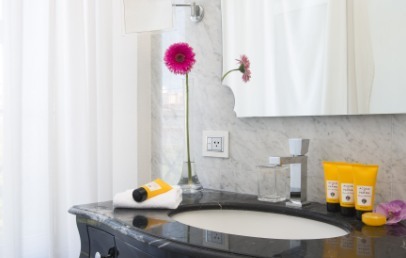 The private bathroom is equipped with shower and courtesy toiletry set. The Superior rooms have a sea view. Two sun beds will be reserved for guests in the grounds. 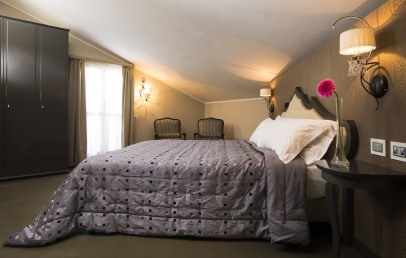 Only for Charming customers: free upgrade in the higher room category (upon availability) + welcome drink on arrival!